A new tip is posted each month on the home page, and then moved here. The training tips are tidbits of information to help with clicker training or ideas for new things to try. Some of these are things I discovered through my work, some are taken from other sources. I have given credit if I can remember where I learned something. Adding Energy: When training a behavior where you want more energy, using a preferred treat for the better efforts can really help to increase the horse's enthusiasm and motivation. The excitement over the food works to your advantage in this situation. In other situations where the horse is getting too enthusiastic, it sometimes works better to stick to your regular treats to encourage a calmer and more thoughtful response. Alternate reinforcers: Fly season is a great time to start introducing alternate methods of reinforcement to your horse because many horses have itchy spots and a moment of scratching is appreciated. If my horse is used to click=food reward, I will start by reinforcing known behaviors with scratching and use a verbal marker instead of clicking. Backing: I teach my horses to back from a hand cue on the front of their nose. It is helpful for my mare who bumps me with her nose when she is nervous and is an easy way to nicely ask my gelding to get out of my space if I am working on something and don't mind his company, but he is being a little too helpful. According to Bettina Drummond, backing a horse by lowering his head and pushing (nicely) on the bridge of his nose is a good way to release the back. Backing: A lot of horses tend to get inverted or high headed when asked to back, especially if backing has been used as punishment. One way to teach a softer back is to ask the horse to relax and drop his head slightly before asking him to back. 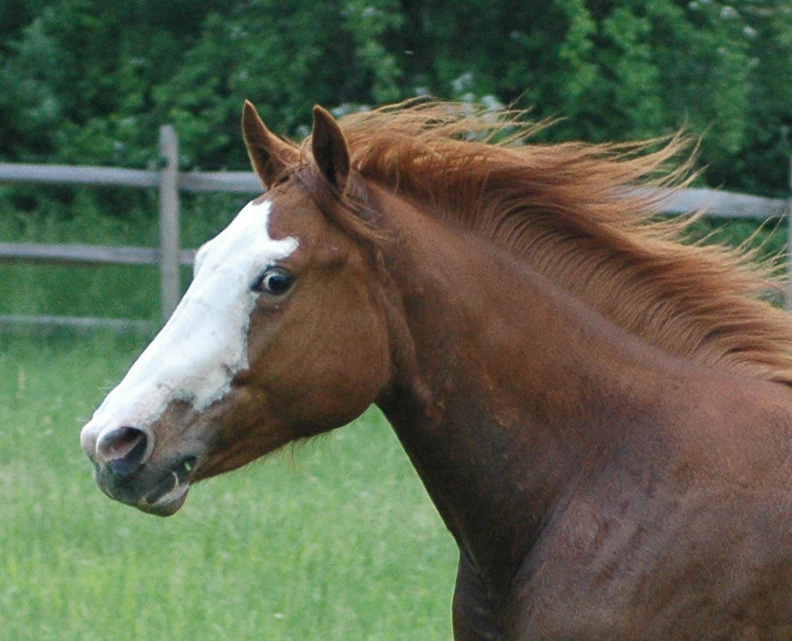 Be Prepared: In the early stages of clicker training, your horse can get so enthusiastic with this new game that he or she throws behaviors at you before you have asked or when you are not ready. It is important to understand this is part of the process and be prepared when you start a session so that the horse doesn't get started without you. I also like to click the horse for moments when he or she waits for me or moments of stillness when it is clearly looking to me for direction. Building Duration: If your horse gets impatient when you are building duration, try counting out loud so the horse knows you are still paying attention to him. For more help with building duration, see the article on duration on the Articles Page. Changing the Bend: A good rule of thumb for feeding treats under saddle is to feed on the side to which the horse is bent. However, I have found that if you are working on an exercise where you work one side and then the other, horses can get stuck in one bend. To help the horse find the new bend, feed the last treat before the change of bend on the new side. So, for example, if working 3 flip 3, I might do 3 sets going left, and feed on the left after the first two clicks (assuming I am clicking at the end of each 3 flip 3 sequence.) After the third 3 flip 3, I will treat on the right, helping the horse to straighten and set up for the new right bend. As my horse becomes more proficient at changing the bend, I can go back to feeding on the side to which the horse is bent, but I find that this little adjustment of feeding on the new side can help a horse that is having trouble changing bend. Classical Conditioning: Don't forget classical conditioning. Morten and Cecilie, presenters at ClickerExpo, suggest taking advantage of times when your animal is more energetic to work on behaviors that benefit from the increased energy level and vice versa. Once the animal associates that behavior with higher (or lower) energy, you can work on it in other situations and get the desired response even if the animal was not initially in the appropriate energy state. Clicking while in motion: Sometimes it can be helpful to click and treat while keeping the horse in motion. If I am clicking for forward to help a sticky horse learn to lead better, I will feed the horse and keep everything moving so that both the click and the treat (primary reinforcer) are delivered while the horse is doing the desired behavior. Most horses do have to learn to eat from your hand while moving, but catch on quickly. This is not recommended for horses that tend to invade your space or would benefit from a chance to stop. Remember that a chance to stop is a chance to ask the horse to go again. But I do use it for horses that seem to think that stopping for the treat means I want them to stand still. Cues: When you are teaching a new behavior and the horse starts to offer it freely, move to another location so you have a chance to cue the behavior again. This helps to keep the cue connected to the behavior and gives the horse a chance to generalize that the cue means the same thing in different locations. Cues: With some animals, getting the behavior is the easy part and getting it under stimulus control is the hard part. Don't be frustrated or surprised if it takes a while for the animal to do it on cue (and not do it at other times). The first cues are often the hardest to teach and once the animal understands about cues, it will learn new cues for new behaviors more quickly. Cues: Cues often evolve out of the training process, but if you want to see if your horse really understands about cues, try free-shaping some behaviors and then attached "unrelated" cues to them. See how long it takes to get the behaviors under stimulus control. Just doing this will teach both you and your horse a lot about cues. Cues: When adding a cue to a behavior, make sure that you vary any detail that you don't want to have become part of the cue. This means you need to ask for the behavior in different locations, in different positions relative to the horse and you also need to decide if your body posture is going to be part of the cue. Horses are very context sensitive and a new cue needs to be proofed in many different situations. Default Behaviors: When choosing default.html behaviors, consider picking ones that are easy for the horse to do if you are working around them doing barn work. That way you won't feel obliged to click a lot because the horse is trying "so hard" or have to worry about monitoring if you are reinforcing only the better tries. Most horses figure out when I am actively training something vs. reinforcing behaviors I like as I do other things, but I find it is easier to avoid impromptu training sessions if I keep my default.html behaviors simple. Impromptu training sessions are ok, but too many of them and I don't get anything else done! Duration: If you are having trouble building duration, you might consider how well the horse really knows the cue. A horse that is unsure of the cue will quit earlier than one that is really sure he knows the right answer. I know it can seem counterproductive to go back to reinforcing shorter reps or even just a correct response to the cue, but with some horses, this clarification is helpful and will get them past sticky points when asked to do the same behavior for longer. General Training: If you don't have a lot of time for training or the weather is too cold, you can add in little bits of training as part of your routine. I like to practice working my horses from the right side by leading them in or out to their fields one way on the left and the other way on the right. Even just the act of getting led from the right every day will make your horse more aware of your presence on that side. I sometimes add in a few little targeting exercises when they go in or out. All those little pieces add up to make a difference. General Training: A lot of riding issues can be solved by working them through on the ground. Most people do groundwork as prep for riding but then they forget that they can go back to working on the ground when they have a problem. I find that working a horse in-hand allows me to have more control over head and neck placement, a better view of how the horse is using his whole body and allows me to break things down into smaller pieces. In addition, it is easier to treat in position and get the horse on a rapid rate of reinforcement. Working on a lunge is another great way to see what is going on and help the horse figure out balance and coordination issues without the added weight and complications of a rider. Hand Targeting: Teaching a horse to target your fist is such a useful skill. I don't teach this until the horse is really clear that I am not offering food unless I have just clicked, but then I use it for lots of things. Most recently I started using it to teach Rosie to wait for the cue before offering a behavior. I have a few behaviors where it takes me a moment to get organized and I don't want the horse to start without me. I started asking for a nose target when I was ready to go and now she waits until we do the nose target before she starts. This is a nice way to deal with the anticipation without frustrating her. Head shy or nippy horses: If your horse is uncomfortable being patted on the front of his face and either pulls back or nips at you, teach him to allow you to touch his jaw instead. This allows you to approach from the side, avoiding his blind spot and helps teach him that a hand extended toward his face is not always going to be offering food. Once he is comfortable with allowing you to reach past his mouth to earn a click, you can start touching in other locations. 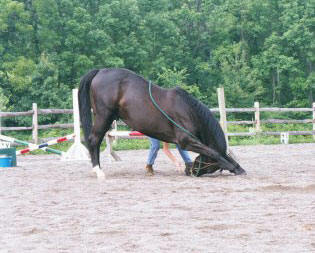 Head lowering: If your horse already knows how to drop his head from poll pressure, you can use this to help teach the rein cue. Using Alexandra Kurland's rein handling skills, slide down the rein, and as you do so, lift your inside hand (the one closer to the halter/bit) up towards the poll. 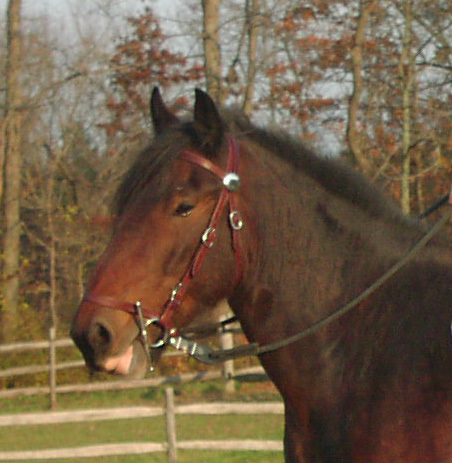 If the horse does not drop his head, allow the rein to slide through your hand while maintaining contact until you can put your hand on the horse's poll. Ask the horse to drop his head from poll pressure, click and release the rein when he does so. After a few repetitions of this, the horse will start to anticipate the poll pressure and drop his head off the rein cue. Click and reinforce that and soon he will drop his head from a lift of the rein. Head lowering or other behavior with stacked criteria: If you are working on training your horse to do 2 things at once (e.g. walk forward and keep her head lowered), you can click for the first behavior a few times and then click for the second behavior. 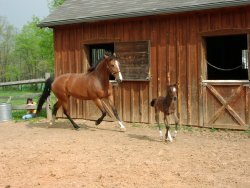 If you keep going back and forth between the two behaviors, there will be moments when the horse does not end the first behavior before starting the second. Clicking these moments helps your horse figure out that you want both behaviors at once. Hind End Awareness: You can teach your horse more hind end awareness by doing matwork with the back feet or teaching it to back over a pole. Identifying what is reinforcing behavior: It is important to be aware of what reinforcers are available to your horse at any given time. If you are clicking and treating and not making any progress, you need to look at your own timing and rate of reinforcement and then see if there is anything else that is reinforcing the horse for an alternate behavior. I have found that it is important to be aware of what might be driving unwanted behavior. Loopy Training: You can use what happens between the click and treat and the treat and start of the next repetition as information about how your training is going. A horse that takes the treat promptly and is ready to go again is telling you that everything is ok. A horse that is hesitating about taking the treat or seems distracted and is adding extra behaviors probably needs you to break the training down into smaller pieces. (This detail comes from Alexandra Kurland's concept of training loops). Mat work: An easy way to build duration during mat work is to ask the horse to stand on the mat while you pat him. If the horse can stand on the mat while you reach out and pat him, you can click as your hand pats the horse and the horse will learn to stay on the mat until you touch it. 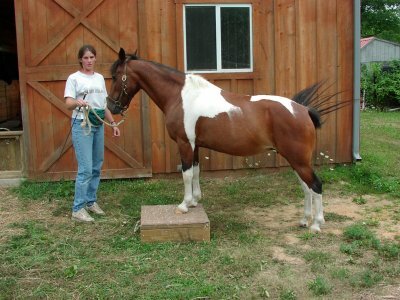 It is easy to build duration by adding in more patting and moving around the horse. This leads easily to ground tying and teaches the horse to keep his feet still even when you are moving. 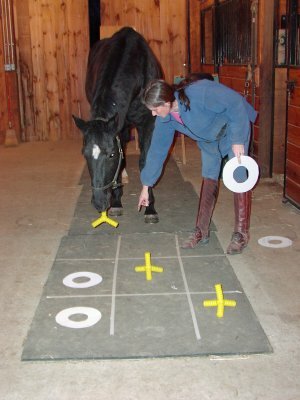 Mat work: If you have a horse that paws a lot when learning mat work, and you end up clicking while the horse is pawing, making sure that you deliver the treat when the horse is not pawing can minimize reinforcement for pawing. So, if the horse paws as you click, time your treat delivery so that the food is actually delivered when that foot is now on the ground. Remember that while we think of the click as marking the desired behavior, the food itself is a primary reinforcer and you can use that to your advantage. Mat work: To teach your horse to stand on mat with his hind feet, you can walk the horse forward on to it but the horse might become frustrated if he wants to put his front feet on the mat. So another option is to stand the horse and then place the mat underneath him, just in front of his hind feet. You can click for forward movement of a hind foot toward and on to the mat. I like to use a piece of plywood for this as it gives the horse nice feedback on his foot position. 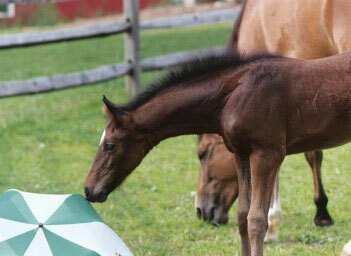 New Behaviors: When I am training a new behavior, I don't worry about if the horse "knows" what I am clicking. If I reinforce a position enough, awareness will come. So if I am training head lowering and my horse happens to drop his head to sniff at something, I click and reinforce that. My goal is to get the behavior and even if the horse is not consciously dropping his head because he thinks I will click him, I am still building a reinforcement history for that position. Nippy Horses: If you have a horse that nips at you as you pass his stall door, teach him to tuck his nose in as you approach. This is easy to free shape and if you feed the horse by reaching over the door, the horse will learn to back up just a little as you approach. In our barn this is handy as the the horse can hang his head out over his stall door and he just backs up a step when I approach. He is happy to come forward if invited, and I don't have to back him up to slide the door open without whacking him in the head. Pole Work: eaching a horse to step sideways over a pole is another great way to improve a horse's sense of where his feet are. It is easy to free shape this if you set it up so that going forward is not the easiest answer and you have done some lateral work previously. Targeting: I use targeting to teach the horse not to mug me for food. By holding the target out at a distance and feeding in the same location, I create a zone of reinforcement that is out away from my body and this keeps the horse focused on what works (touching the target). Often this is enough to teach the horse that mugging is not productive. If it is not, I will do some formal sessions on taking the nose away and it is usually easy at this time because the horse has some reinforced behaviors and it quickly offers something clickable instead of mugging. Targeting: If you are trying to get duration on a target and your horse keeps playing with the target, try using a piece of tape on a wall, or some other fixed object that is not as easy to manipulate. I will tape a piece of colored or white cardboard to the wall with duct tape and use that for fidgety horses. Targeting: It is useful to teach your horse to target your hand when presented as a closed fist. If you are in a situation where you need a target but one is not available, then you can use your fist instead. If your horse tends to nip at targets, then you need to teach your horse to target with a closed mouth before training this. This can be done by clicking before the horse touches the target and tries to mouth it, or by letting the horse mouth the target and clicking for a moment of stillness after he has discovered he will not get clicked for putting his teeth on the target. Teaching a Retrieve: For horses that are reluctant to hold objects in their mouth, I have found that it is just a matter of persistence. Even if I feel that I am making no progress, I just keep doing a little session every few days, clicking for any lip movement or touching the object with the mouth instead of higher up on the nose. I might also try different objects. A lot of horses find it easier to pick up a towel or piece of cloth than a plastic toy. Transitions If you want to work on downward transitions, you can set up your horse to listen to you by using a pattern where you click at the same location multiple times, and then asking for the transition at the same place. If your horse is anticipating the click, he will be paying more attention to you and preparing to slow down. You can use physical markers or geography in the ring. I find corners are useful places to work on down transitions. What's in your toy box? Do you have a barn toy box? If you are not sure what to do and only have a few minutes, horses love free shaping and can learn to be quite creative. My barn toy box has odds and ends from my kids as few as some other items. At the present time, it contains a frame ball (for fetch) a deflated playground ball (for fetch or basketball), a dog toy shaped like a jack (for tic-tac-toe, fetch), a pinwheel (Rosie spins it with her nose), a piano, a ribbon stick (Willy twirls it), a hula hoop (Rosie puts her head through, Willy flips it over his head, Buster walks through it), cones (for stacking), tennis balls (for putting on cones), a bike horn, a towel, a long target stick, an umbrella (will your horse put his head under it? ), some makers (for drawing pictures) and an Easter bonnet.